A line of eager guests waiting for an additional hour to enter Le Poisson Rouge for Opening Ceremony's spring 2019 presentation wrapped around Bleecker and Sullivan Streets last night. 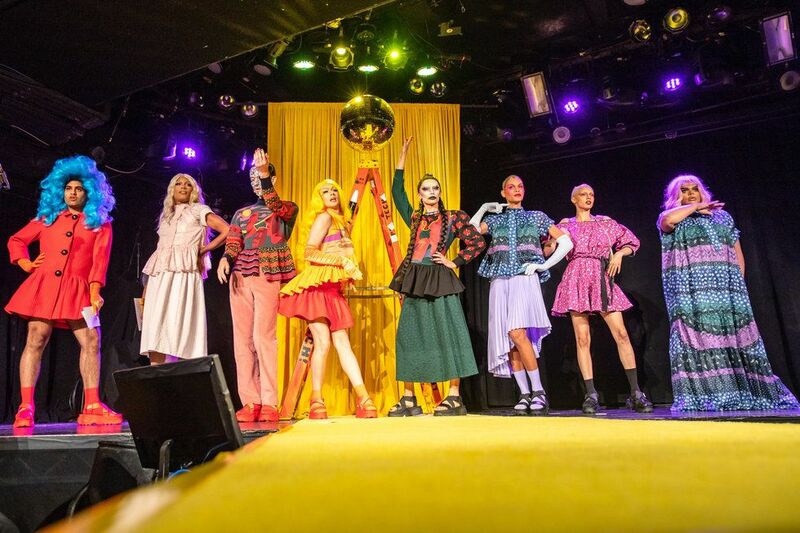 Titled "The Gift of Showz" — created by RuPaul's Drag Race season nine winner Sasha Velour and OC creative directors Humberto Leon and Carol Lim — the drag extravaganza was partly delayed by the late arrival of celebrity guests (cough, cough Nicki Minaj — Troye Sivan, Kim Petras, and Whoopi Goldberg were all punctual). Once inside the live music venue located in Greenwich Village, all waiting fatigue was cured by Sasha's performance of "A House Is Not A Home." Sasha Velour performing "A House Is Not A Home." Humberto Leon grew up gay in a traditional Chinese family in Los Angeles. At age 15 Leon, who had few queer role models, eventually befriended a group of colorful characters who put on drag shows at an all-ages club called ABC. Fittingly, Sasha touched on the power of community for marginalized people and the incredible art they create together in her opening remarks. 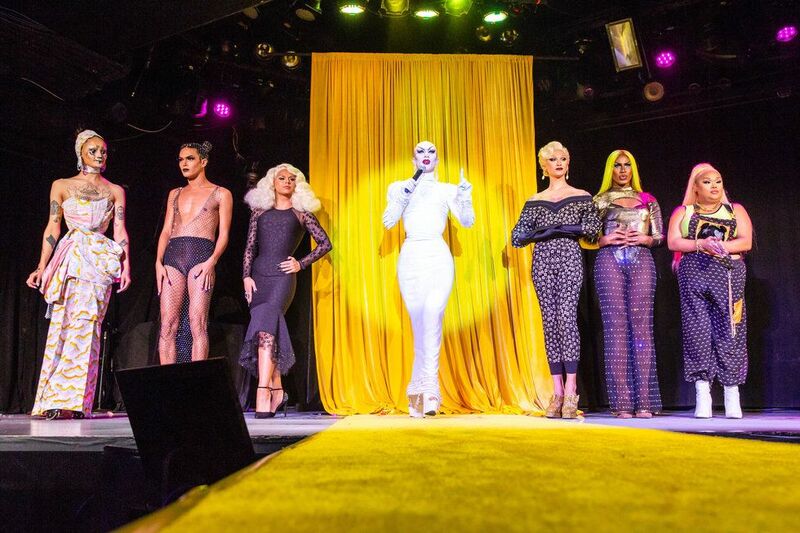 "It takes one person to put on drag," Sasha said on stage (shortly after admitting that it took three that night to put on her's alone), "but it takes a family to put on a show." 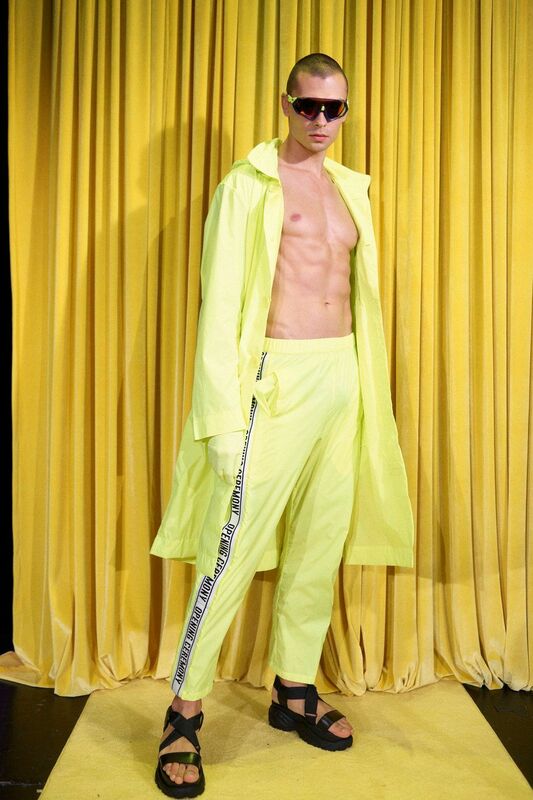 A group of young performers, models, and writers including Christopher John Rogers muse Michael Phillips, model and stylist Marc Sebastian, and performance artist Alok Vaid-Menon opened the show, modeling pieces from the brand's spring collection. Looks ran the gamut from vibrant peplum tops and maxi dresses covered in original prints to tailored gingham suits and plaid outerwear. Styled without regard for gendered dressing, the ensembles were accompanied by heels made in collaboration with Fluevog, hiking sneakers, and flat-form sandals. New York drag fixtures including Lypsinka (who's known in fashion circles for walking Thierry Mugler's runway in 1992), Miss Fame, Jiggly Caliente, Shae Couleé, Hungry, and West Dakota each designed a costume out of fabrics from Leon and Lim's spring collection. Most notable was Hungry's jumpsuit which became a cocktail dress with a tug on the trousers. Eventually they undid the sweetheart neckline number to reveal a corset and mesh slip covered in crystals that matched their surreal, sparkly beauty look. A raffle was held in support of the Transgender Law Center, the country's largest trans-led organization. The prizes including a $1,000 gift card to Opening Ceremony and tickets to Sasha's "Nightgowns" performance on September 28th were given away at the after party in the same space. Twice during "The Gift of Showz" Sasha fooled the audience into thinking PAPER cover star Christina Aguilera was hiding behind the velvet curtain waiting to perform (on the first occasion, an Xtina cardboard cutout was revealed and on the second Farrah Moan posed as the pop diva). When Sasha began introducing her for the third time, the crowd was silent, anticipating another joke. Suddenly, Aguilera emerged from the velvet curtain wearing a black silk gown with a plunging neckline, high center slit, and net overlay dotted with crystals. The queens began lip-syncing alongside her in an unforgettable, live performance.